Carbonated Water, Sugar, Citric Acid, Sodium Benzoate, Root Beer Flavour, Caramel. 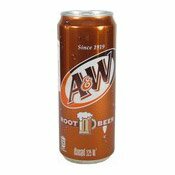 The original - A&W Root Beer. Classic american fizzy drink which also makes the best ice cream sodas. Love Root Beer? Then buy this pack of 12 and save!